tmmcmusic: I Feel A Song Comin' On! I Feel A Song Comin' On! This is just to keep you up to date with the state of our very own McMusical La La Land. 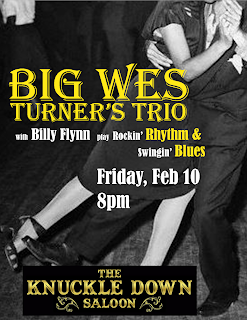 Do it with Big Wes Turner’s Trio (featuring the one and only Billy Flynn). They'll be swingin’ and guitar slingin’ at The KnuckledownSaloon, Madison’s premiere Blues (and Blues dancing) venue. Toodle over to the accessible southeast side of town for an appreciation of this friendly venue and accommodating dance floor. The music gets going early (downbeat at 8pm) so revelers (like you) can enjoy a dance and a drink (or several) and still make it home in time to hit the pillow for a wholesome night’s sleep (ahhhhhh...). A Jimmy Buffett Party? Yup. Tom climbs aboard with Chuck Bayuk and the Drunken Sailors at The Harmony Bar & Grill. Expect plenty of Parrot-head pleasin’ JB standards (not to mention tunes from John Prine and other singer/songwriters of the same era). Music and boat drinks from 3 to 6pm. It’s a fun way to spend your Sunday afternoon and your donation supports the Madison ParksFoundation. Rain on the Plain in Ukraine?